This is a handwritten, one page letter from Leopoldo (Leo) Mascioli to his son, Daniel Mascioli. 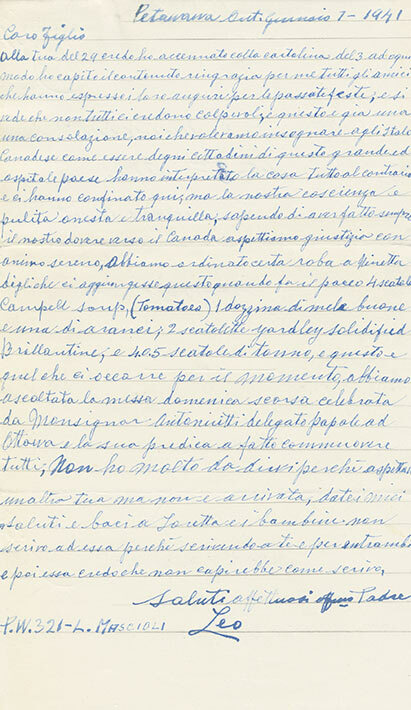 Written on lined paper with blue ink in Italian. Dated January 7, 1941. Thank all our friends that have expressed their greetings for the recent feasts and we can see that not everyone believes us to be guilty. This is already a consolation. We that wanted to teach the Italian Canadians how to be a worthy citizen in this great and hospitable nation, they have interpreted all things to the contrary and have confined us here. But our conscience is clean, honest and tranquil knowing to have always done our duty towards Canada and await justice with a serene soul. We have ordered certain stuff from Ninetta. Tell her to include the following when she prepares the parcel: 4 cans of Campbell soup (tomato), 1 dozen good apples and 1 of oranges, 2 cans of Yardley’s solidified Brillantine, 4 or 5 cans of tuna. That’s all we need for now. We attended last Sunday’s mass celebrated by Monsignor Antonicitti, the papal delegate from Ottawa. His preaching moved everyone. I don’t have much else to say. I am waiting for your next letter but it hasn’t arrived. Give my regards and kisses to Loretta and the kids. Tell her that I’m not writing to her because writing to you is like writing to all and sometimes I believe that she may not understand how I write. Hello and affectionate regards, your father, Leo.